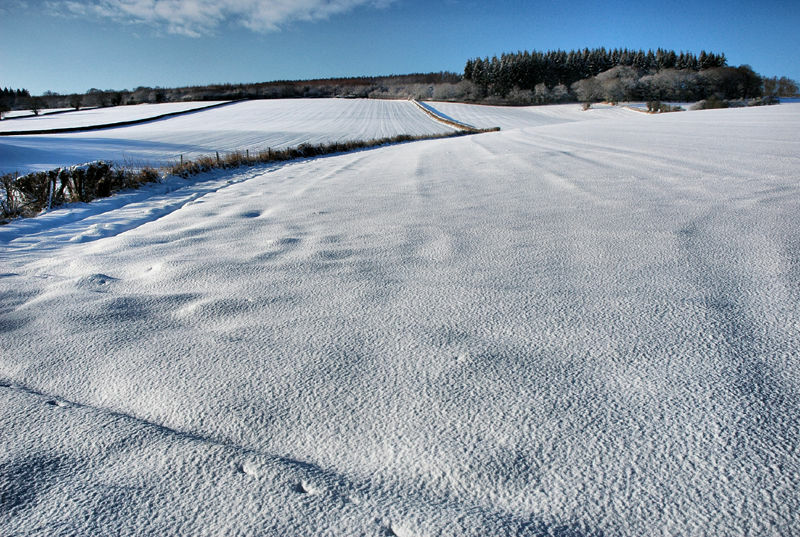 grouser (Ludlow, United Kingdom) on 9 January 2010 in Landscape & Rural and Portfolio. On the way up to Mortimer's Forest in Ludlow following an ancient track to a place called Starve Crow, I trudge through a white desert. Stunning photo! A beautiful "carpet" of beautiful white shades! Trees gently break the flatness of the composition. A lovely clean crisp shot, I'm enjoying the change in landscape! I was going to comment yesterday, but I suppose tomorrow will have to do. What a delightful image! Your title too is excellent! Oh yes..I will really like this shot yesterday. What a beautiful expanse of snow. It's just lovely if you don't need to go anywhere..
Nice and vast winter landscape. Great shot! Very nice picture ! Great light ! I like how the fence row divides the image. The snow's texture is remarkable. A fine looking landscape. White desert it is..... but at first I thought you where on the piste of a ski resort. It's a great winter setting. An ace composition in what I imagine is a difficult landscape . . past or present. i wonder if snow has a blue hue because it reflects the color of the sky? i think that's why liquid water is blue. What a smooth carpet & what a light ! pure divinty under a blanket of white -- lovely!